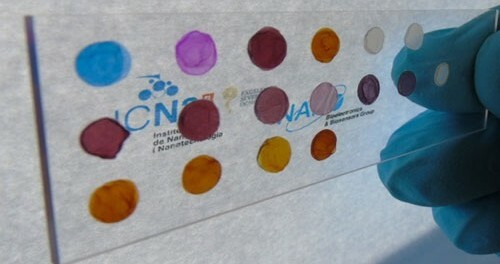 Nanopaper, made from cellulose like traditional paper, shows much lower surface roughness and much higher transparency than traditional paper. This is due to the nanoscale dimensions of the cellulose fibers (‘nanocellulose’) used for its production. Nanocellulose is a sustainable material that can be extracted from plant cellulose pulp or synthesized by certain bacteria. Nanocellulose has been explored in various fields, including filtration (“Nanocellulose filter cleans dirty industry“), wound dressing, as replacement for toxic dyes in textile or security applications, as sponges to combat oil pollution, or as substrate material for flexible and transparent electronics. Another significant area for nanopaper applications are sensors. Paper-based sensors promise to be simple, portable, disposable, low power-consuming, and inexpensive sensor devices that will find ubiquitous use in medicine, detecting explosives, toxic substances, and environmental studies. In a new paper, published in the July 2, 2015 online edition of ACS Nano (“Nanopaper as an Optical Sensing Platform”), Merkoçi and his team describe various nanopaper-based nanocomposites that exhibit plasmonic or photoluminescent properties that can be modulated using different reagents. The sensing platforms include a colorimetric-based sensor based on nanopaper containing embedded silver and gold nanoparticles; a photoluminescent-based sensor, comprising CdSe@ZnS quantum dots nanocrystals conjugated to nanopaper (which can be photoexcited using UV-visible light); and a potential up-conversion sensing platform constructed from nanopaper functionalized with NaYF4:Yb3+@Er3+&SiO2 nanoparticles (which can be photoexcited using infrared light). Morales-Narváez explains that the proposed nanopaper-based composites can be obtained using different pathways (depicted in Figure 1 above) including by exploiting the hydroxyl-containing groups of the bacterial cellulose as a reducing agent for chemical reduction of noble metal ions to metal nanoparticles (Route A; see Figure 1A); by adding bacterial cellulose as a nanonetwork to embed metallic nanoparticles during their synthesis (Route B; see Figure 1B); and by producing surface carboxylic groups on the cellulose, for subsequent coupling with protein/amino-functionalized nanoparticles (Route C; Figure 1C,D). The team explored modulation of the plasmonic or photoluminescent properties of these platforms using various model biologically relevant analytes (the drug methimazole, the toxic compounds thiourea and cyanide, and iodide). 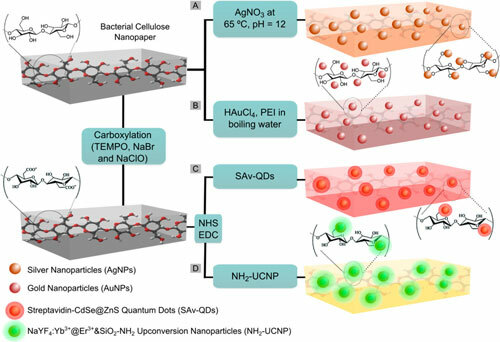 Moreover, the scientists demonstrate that bacterial cellulose nanopaper is an advantageous preconcentration platform that facilitates the analysis of small volumes of optically active materials (∼4 µL).